Those brave soldiers that join the military risk their lives every day to protect our freedom. Sometimes, we, unfortunately, take that for granted. 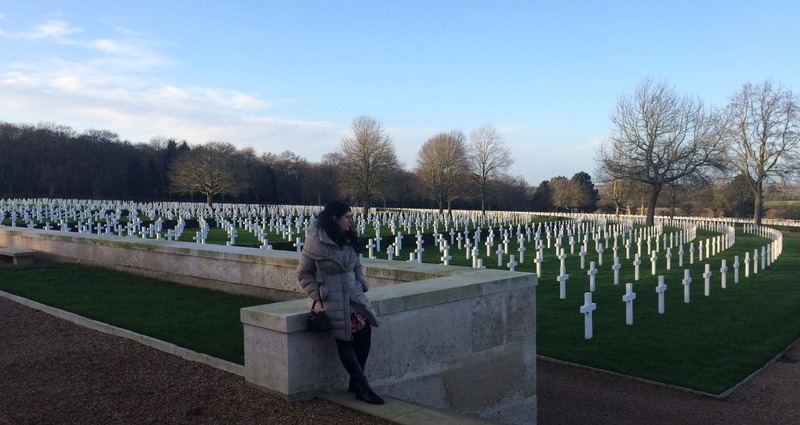 I visited the Cambridge American Cemetery to pay my respects and learn more about the history. It was definitely a moving experience. Let me tell you more about what we saw during our visit and why you should consider adding it to your itinerary when you come to Cambridge. 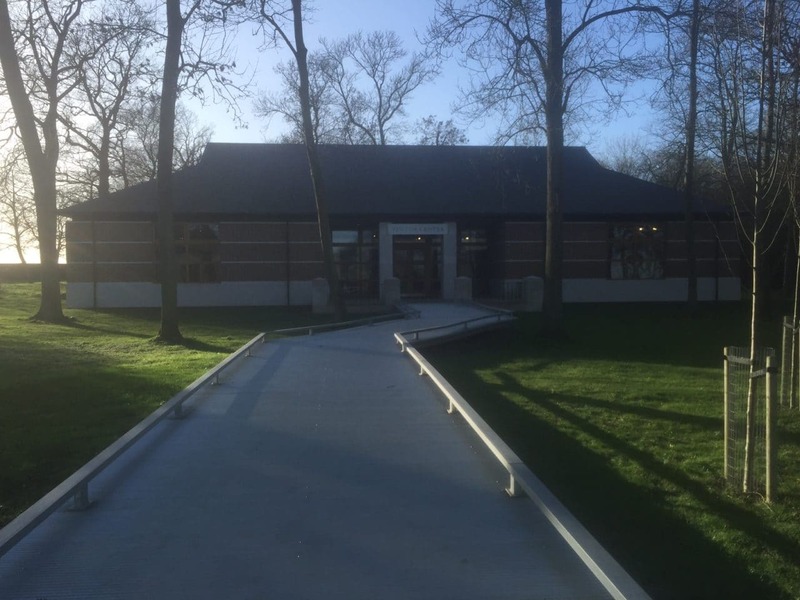 The Cambridge American Cemetery is free to visit and there is plenty of parking. It is located a 10-minute drive outside of Cambridge and unfortunately not accessible by public transportation. 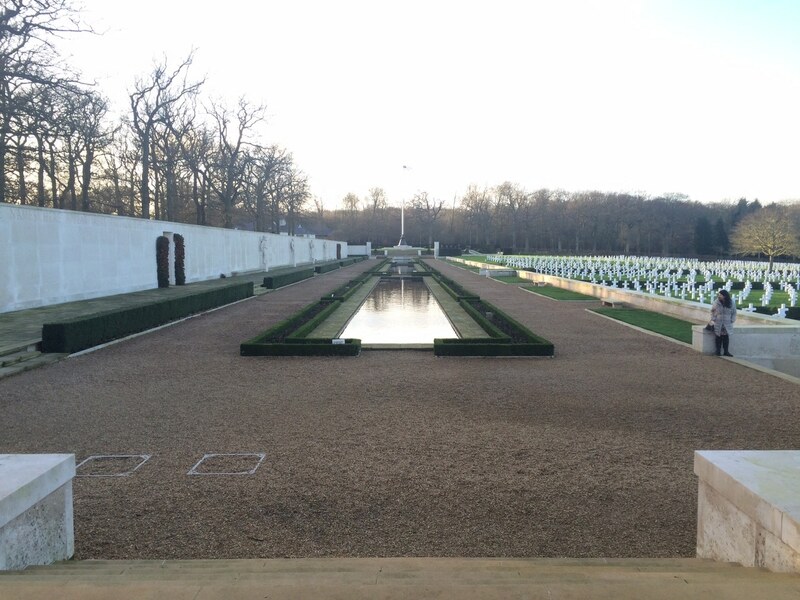 The Cambridge American Cemetery is open from 9 am to 5 pm daily except for Christmas and New Year’s Day. A look at the mall from the chapel. I stood by the flagpole and looked over the lawn. All I could see were graves. I decided to walk closer and then I noticed that not all the graves were crosses. I saw some that were the Star of David. The cemetery contains the remains of 3,812 soldiers, most who died in Battle of the Atlantic or in other missions over northwest Europe. On the south side of the mall, across the reflecting pools, you will find the Walls of the Missing. 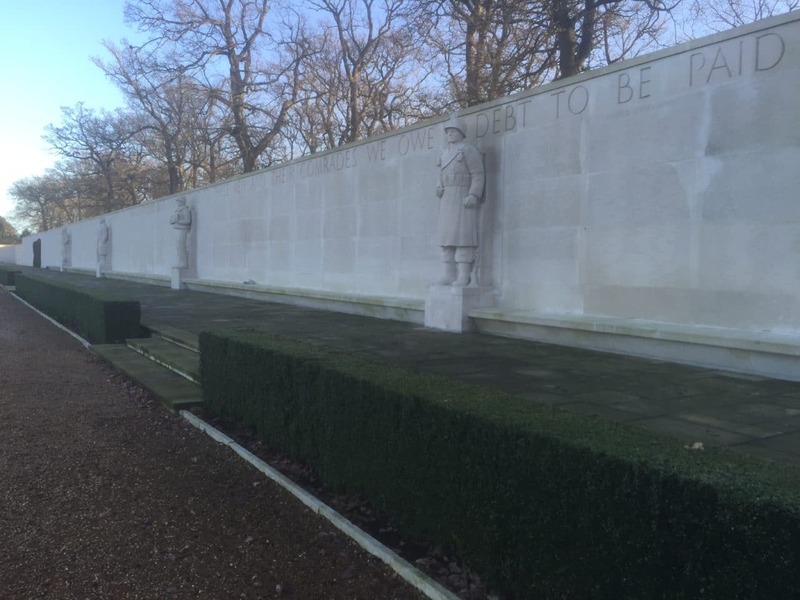 The 5,127 names recorded on the wall are more than the number buried in the Cambridge American Cemetery. I just can’t imagine what all the families went through. Also, be sure to check out the visitor’s center which was newly redone in 2014. The staff there are happy to answer questions and have access to the Cambridge cemetery records. There are some great exhibits about World War II. To start, there is a short introductory film. For all you history lovers, there are also touch-screen kiosks where you can learn more about the Battle of the Atlantic, the Strategic Bombing Campaign, and the story of Americans in Great Britain during World War II. In the back of the visitor center, you can read the stories of a few of those that are buried or memorialized at the American Cemetery in Cambridge. One of those featured was Joseph P. Kennedy Jr., Lieutenant, U.S. Navy Reserve, the brother of the late President John F. Kennedy. On August 12, 1944, his plane exploded while on a mission from England against a German rocket site in France. His name is on the Wall of the Missing. I was really moved by reading the stories that they shared about some of the missing and dead. It just made me think about all the individuals that have made the ultimate sacrifice. The chapel is at the other end of the mall from the visitor’s center. 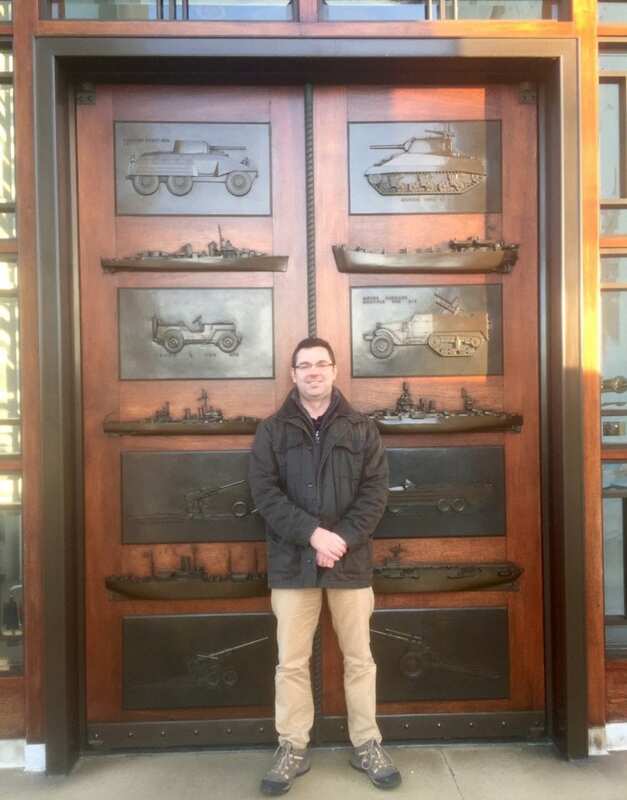 The doors are quite impressive, I really liked the military artwork. At first, we weren’t sure if it was open because we had a little trouble with the door. The chapel itself is small with impressive artwork throughout, even some on the ceiling. The map on the wall was informative and artistic as well. There were also windows with the names of each state. We took a few minutes to locate the Texas one. Visiting the Cambridge American Cemetery was a very moving experience. When you think of what the families went through it just tugs at your heart. And to put things in perspective, the Cambridge American Cemetery pales in size compared to Arlington National Cemetery where 400,000 are buried. I haven’t had a chance to visit Arlington Memorial Cemetery yet, but hopefully on my next trip to Washington DC. Especially with Memorial Day coming up, I would love to hear how you show your appreciation to those that have served their country. The Cambridge American Cemetery is not accessible by public transportation, so you will need to either drive or take a taxi. It may be difficult to fit in your itinerary if you are only visiting Cambridge for one day. Don’t miss the individual stories at the back of the visitor’s center, I found them very moving. There is no admission charge and the Cambridge American Cemetery is open from 9 am to 5 pm daily except for Christmas and New Year’s Day. While you are in Cambridge, you should also try punting on the Cam. Cemeteries are always a fairly sobering experience. This one looked beautiful, though. I love the shot of Anisa with the perfectly spaced crosses elegantly lined up in arches. Thanks Mel. It really was a sobering experience. I will pass on your compliments to my boyfriend Russell for the photo. I did not know about this one in Cambridge, but I have visited one in Normandy (France) as a school trip. I remember it was very moving to see the number of white crosses that seemed to go on forever. It makes History more real. I am not the kind that would go to a memorial or a ceremony to show appreciation. I think it should be done in our everyday life. Trying not to repeat the mistakes that led us where people had to sacrifice their lives. Respecting the values they fought for. But I think it is good to keep a visual of what happened, and of who gave their lives. Not to forget, and also to understand how big it was. Numbers don’t give as much shivers than a long list of names or a series of white crosses. This was actually my first military cemetery. It really inspires me to visit more. You are right it is important for the world to always keep in mind the values that they fought for and not repeat past mistakes. I am not sure that is happening right now and that really worries me. There’s always a special feeling in every cemetery, something hangs in the air, and hundreds of stories just waiting to be told. I think especially so at military cemeteries. Piritta – Well said. Makes me wonder about all those that did not have their stories featured. Thanks for sharing this, as a kiwi I celebrate ANZAC day with a dawn service at our local cemetery. I think it’s great that we remember our own history as well as learning about other when we travel. Thank you. It is easy to forget about all the sacrifices that have been made so agree it is always good to take time to remember and appreciate things. Touching subject, I’m glad you wrote this post. It is important for us all to remember. Thank you Briana, I’m glad you enjoyed it. It is always heartwarming to visit such places but important to pay our respects. I would say it will kind of fall under “Dark tourism” like Apartheid museum and Killing fields. All so saddening yet crucial to understand and educate ourselves. Jo – Yes definitely agree it is saddening, but important to understand so that we don’t repeat our past mistakes. What a unique place; thanks for sharing your experiences. I appreciate cemeteries for their stories, their serenity, their beauty. And each is very unique, right? This one looks both similar and different from Arlington, which I visited several years ago. Different in size as you mentioned but similar in intent, beauty, and inspiration of thought and reflection. Cemeteries in New Orleans, for instance, are completely different from those here in Wisconsin, for a variety of reasons. But cemeteries are engaging places, to be sure. I enjoyed this post; a good reminder for Memorial Day. Karla – Yes I agree. The cemeteries in New Orleans are so unique. I have also been to one in Argentina, which was also different than any other cemetery I had been too. But yes in spite of all the difference they are places that hold so many inspirational stories. My granddad was in the Irish army, an uncle served in the navy and my dad was in the army reserves. Although Irish soldiers only serve on peace keeping missions, it is an honour to serve one’s country. It’s lovely they have a visitor centre and exhibitions on WW2, it adds an extra dimension to the cemetery. There’s something about the images of those white crosses that’s both sobering and powerful, if that makes sense. Marteen – Your family does have an impressive military tradition. Yes I really enjoyed the visitor center. And yes your comment makes sense – the military is very powerful but the loss of life is real. 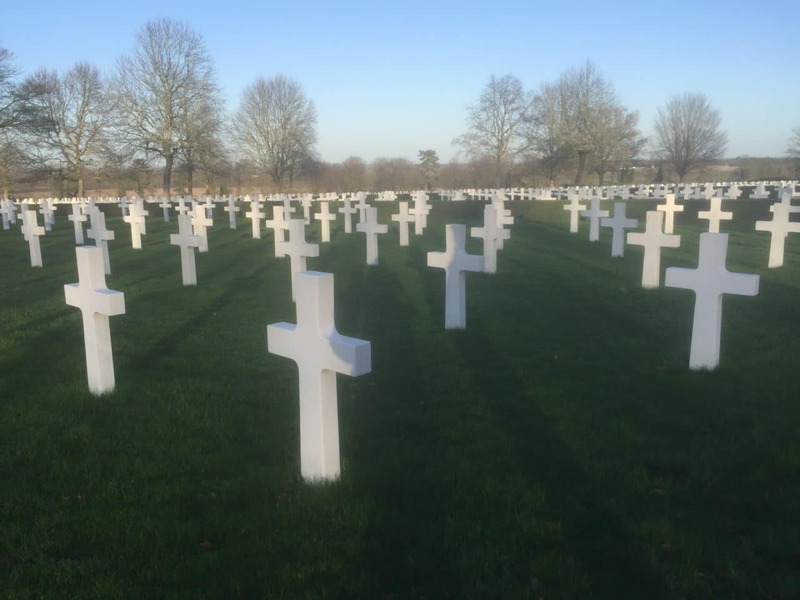 How cool is that – an AMERICAN cemetery in the UK! WHo’da thunk it! Jessica – I would definitely recommend visiting Cambridge. It is a beautiful city with lots to do (check out my post about punting). Visiting Normandy is definitely on my list. I can imagine working with Veterans is very rewarding and also very eye opening at the same time. I talked about the stories of the missing and dead, but I know all those that serve go through a lot. I visit cemeteries pretty often when I travel. Some of them are world wide famous, each for a different reason. The Cambridge American Cemetery is a sad reminder of the many lives lost in the World War II. I didn’t know about it. Yes, thanks Anda. I would love to hear about some of your favorite cemeteries.